Remember the couple getting married? The wedding is this weekend. I was checking out their registries and noticed they would like this great set of napkin rings. Aren’t they sweet? And thought, yes, I’ll get those and then make them a few napkins to be hold in their great set of napkin rings. 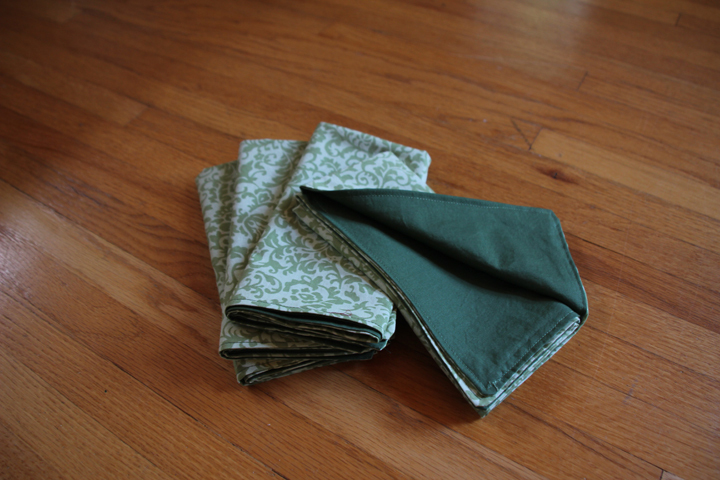 So, I made some simple cotton napkins using a delicate sage green print on one side and a bold, darker sage green on the other. They are 16 inches square with simple topstitch around the whole napkin. I really enjoyed choosing the fabrics and putting them together. In fact, they were so much fun, I’m making more this weekend. They’ll be in the shop soon! And don’t forget to sign up for the International Craft Swap! By Sunday! Hurry! I DO like those napkins rings and what a fab idea to pair your wonderful handmade napkins with them. Perfect. I love them! Especially the solid-on-one-side, patterned-on-the-other design.